In 2015, there was a meeting at my school about an expedition to Cambodia, obviously there were a lot of people interested as it’s a place that not many people had heard of and was on the other side of the world! The cost of the trip was £4,000 and there was an expectation for the participants to raise this money themselves. I really wanted to go, my parents felt that it was a great opportunity and they paid the deposit for me. Initially. I wasn’t too motivated on fundraising. Two years felt like a long time and during this first year I was busy with my GCSE exams and I really didn’t give it much thought. A year before the trip I began to sell the odd thing on eBay. I work as a waitress on match days at Newcastle United Football Club so I gave my mum half of my wages. I even went through a time when I wasn’t even sure if I wanted to go anymore because a few of my friends dropped out and it was such a daunting thought that I’d be on the other side of the world for a month with nobody that I was close to. After the summer, my mum started getting stressed because our fundraising hadn’t even reached £500. We tried to plan and we set a monthly target but we didn’t realise how difficult and time consuming it would be to raise any money never mind £4,000. It took us a whole day to raise around £50 from a car boot sale, and then a sweet shop at a rugby festival made about £200. We decided that we needed a big event if we were going to raise the total amount of money. I decided that a busking night would be a good idea because I play and am passionate about music so it would be something that we could manage quite well. Eventually, I managed to hit my fundraising target of £4,000. Before I even left the UK I had learnt a great deal. I understand now how difficult it is to raise money, the value of money, but also how kind people and generous people are. I am so grateful for the YET grant which you awarded to me. 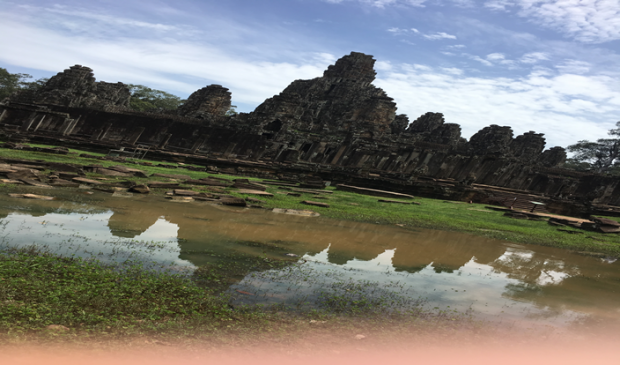 After the long journey and 13 hour flight we landed in Siem Reap which was once the capital of Cambodia but according to teachers is the Cambodian equivalent of a city like Newcastle upon Tyne. We had one night in a hotel and visited the land mine museum. Land mines were planted in Cambodia years ago after the war in Vietnam and are still such a huge problem today. The museum owner adopted 22 landmine victims, most of whom are either in full-time work or studying at the University of Siem Reap. The museum funded the construction of over 10 local schools such as the one I was privileged to teach at. We were all very shocked and moved when we found out about all of this because I don’t think any of us had any idea that this was such a current problem and how the events that happened over 30 years ago are still affecting people today. After the museum visit we went to the homestay, this is where we lived in someone’s house for 10 days. It was a massive culture shock to us all I think. There were bugs everywhere, about two rooms in the house and the toilet was awful. Not to mention there was no electricity or running water! Although there were a few complaints at the start of the week we all really embraced it and we knew this was the most rural and roughest accommodation we’d have all month. The homestay was probably one of the best parts of my trip as it was the most rewarding. We all came together as a group and learnt how to speak and deal with things in ways we don’t have to do back at home. Also the project work was so personal. We were told that we were building a house for a local family because theirs wasn’t big enough. It was honestly heart-breaking the sizes of a house in which six people were living in. It was probably smaller than my shed at home. The people were all so lovely and positive and always so keen to help us by digging, laying bricks, carrying stones, anything. They were all so excited for this new house in the village even if it wasn’t being built for them personally. 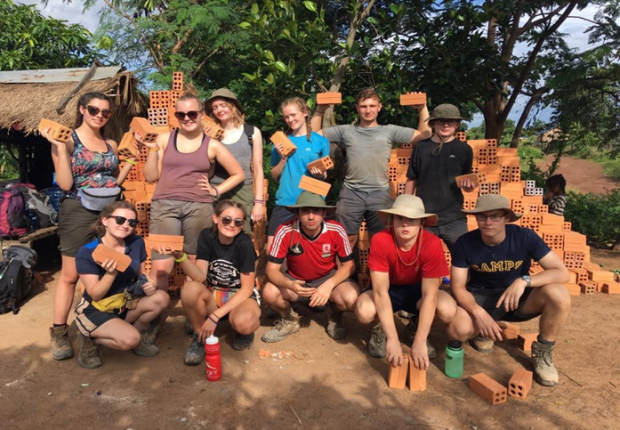 I wasn’t sure how we’d manage to build a house because it was basically a jungle and there were no plans or anything, just a group of teenagers with a few spades and garden hoes. Although we didn’t finish the house we made a good start and the locals were so appreciative of all our help. Whilst at the home stay we also visited a local school, the one funded by the landmine museum. We got told we were going to be doing six lessons in total with the children ranging from years 1 to 6. 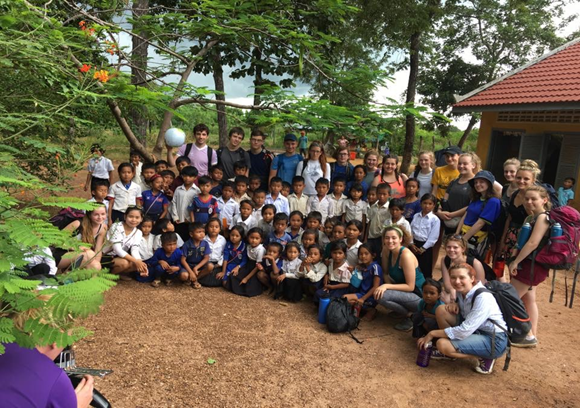 We didn’t know what to expect or what the children would know already but thank god we had two Cambodian exchange students to help us translate! We taught the children numbers which most of them already knew 1-10. We taught them how to say ‘my name is’ , family members, months of the year and by the time we got to grade six the children had to teach us Khmer because they could read and write English and pretty much knew everything we taught them. They did enjoy singing ‘heads, shoulders, knees and toes’ though. All the children were so happy and lovely it was honestly such a pleasure to be able to teach and spend time playing with them. We went straight from the home stay to the jungle trek. The first day was apparently ‘uphill’ but we found it more like rock climbing. It was so hot and I’ve never seen people sweat as much as they did that day. Some people found it a lot harder than others but I think we really came together to help the people who struggled and encourage them to keep going. It was such an amazing sense of achievement when we reached the camp at the top of the mountain and I’ve never enjoyed a can of coke more. The views were unbelievable. However the toilets on the other hand were literally a hole in the ground and we slept in hammocks that night. Day 2 of the trek was a lot easier because it was flat along the top of the mountain. Our next camp was in a monk monastery which was a lot nicer than the previous camp. We watched the sun set; star gazed and participated in a meditation session which I surprisingly really enjoyed. Day 3 of the trek was another flat/downhill walk to a camp which was by a waterfall. 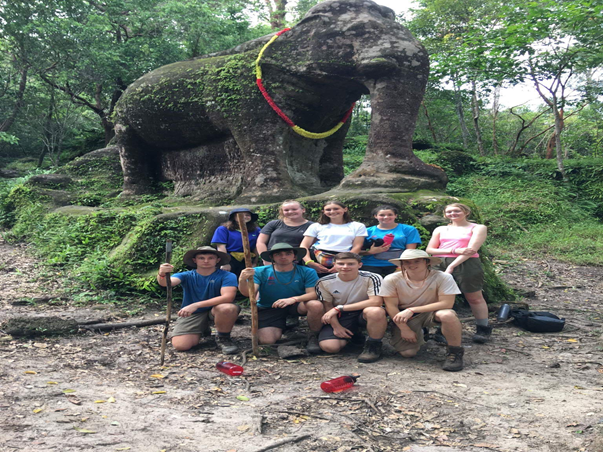 On the way to this camp we visited a bat cave which had a place of worship inside it and also a massive stone elephant in the middle of the jungle. We obviously took this as a massive photo opportunity. 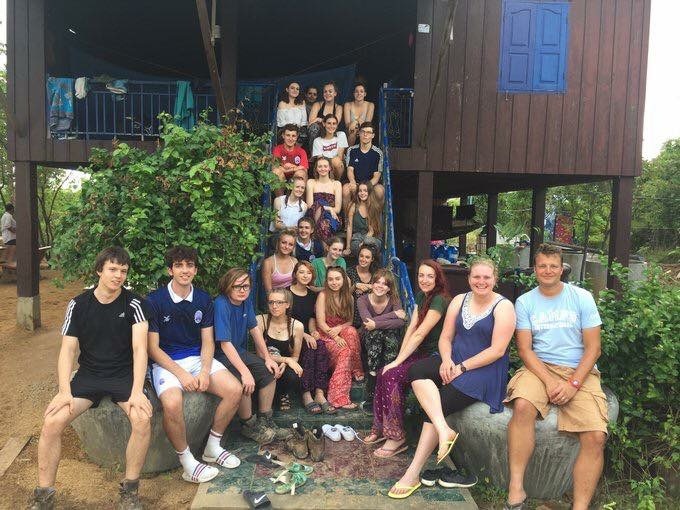 When we arrived at camp we got told we were allowed to go for a swim and have a ‘wash’ in the river which we enjoyed loads and after that we walked down to the bottom of the waterfall which was so pretty. The final day of the trek we were all really tired and in desperate need of a shower! On the way down the mountain we visited a Buddha statue which was carved into the mountain and another temple. After walking down 700 stairs we finally finished the trek. The next couple of days we did touristy things like the night market and the circus which was really good because all the people were orphans/children off the street who now have a career and a way of earning money (no animals). We also went to restaurants meaning we ate something for dinner that wasn’t rice! On the last day in Siem Reap we visited Angkor Wat which is one of the main tourist sites. 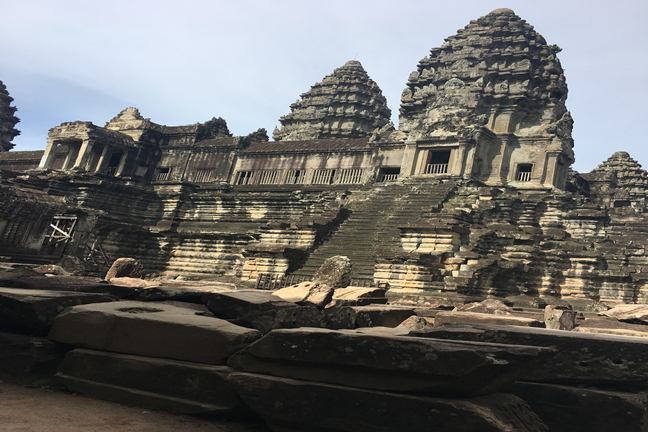 It’s one of many temples in Cambodia but it’s one of the oldest and biggest (we even got told it featured in the film Tomb Raider). The next camp we stayed in was about 5 hours away and we stayed there for about a week. 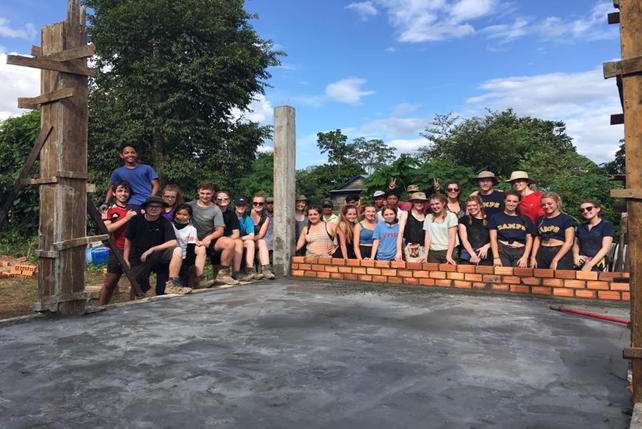 The project work we did was quite similar to the home stay but the area wasn’t as rural so the people had nicer homes and most had a well in their garden meaning they had clean water. 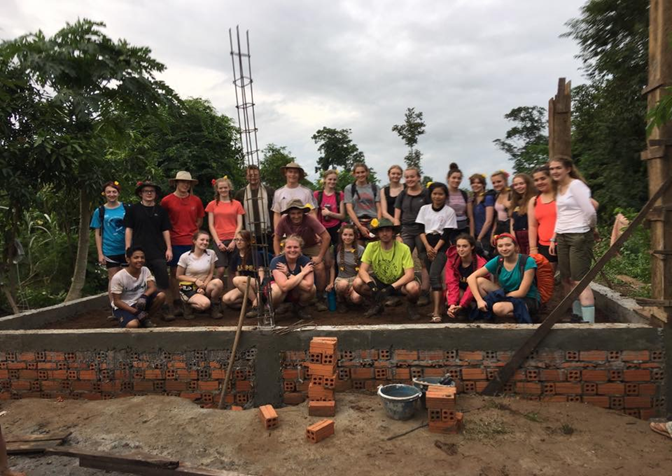 We spent most of the week either building wells or building toilets which entailed a lot of digging and making cement. We spent a lot of our free time playing volley ball with the local children whose English was so good! When we visited the local school we found it so difficult to find something to teach them. We spent most of the lesson listening to them singing the alphabet song, the colours of the rainbow and ‘if you’re happy and you know it’. On our last night, the local people and workers from the camp threw us a little campfire/ leaving party and they showed us some of their local dancing, they found our attempts to dance like them quite funny. 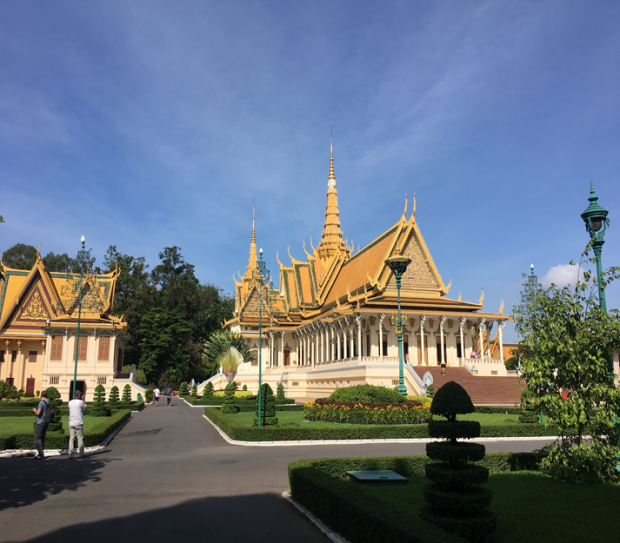 Our last two days were spent in the capital city, Phnom Penh. As well as visiting places like the royal palace and taking a boat trip down the main river, we visited the genocide museum and killing fields which was a very emotional day by all. The prison was literally in the middle of the city in an old high school and we actually met two men who were victims of the Khmer Rouge. They told us they were only still alive because of their skills, one was able to fix typewriters/was an engineer and the other was an artist whose paintings were displayed all over the prison showing the methods of torture and conditions experienced by those imprisoned. The killing fields hasn’t really been touched or changed much at all since the events and it shows what a recent event it was and before visiting Cambodia I don’t think any of us really knew how bad things were or what even happened to Cambodia in the first place. We met so many people who had been effected by the Khmer Rouge and told us their stories and that made it more personal and real for everyone. 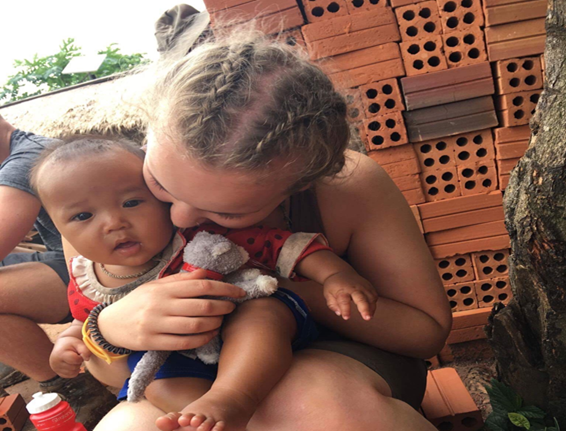 Cambodia was such a massive learning curve for me, having to live with 25 people in such close proximity is hard. I learnt how important patience is and it really helped me to think about how things would not only affect me but affect the whole group. Although talking isn’t something I’ve ever found hard, whilst away it was so important to be open about how you were feeling all the time and that’s something I didn’t realise was important at all. Obviously and probably most importantly I’ve realised how much we need to help people. I only managed to help a few families and hopefully improved their lives and seeing how grateful they were was the highlight of the whole month. We are so fortunate and I won’t take anything for granted anymore. 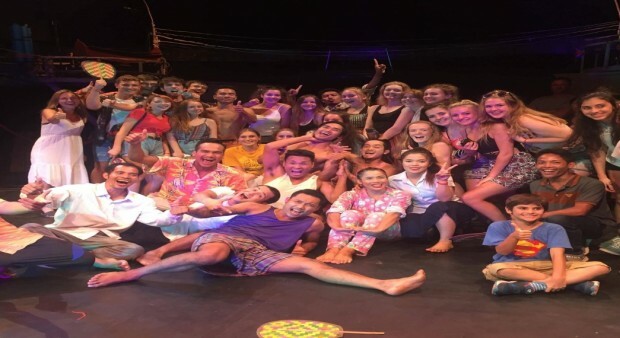 I will never forget the time I spent in Cambodia; it will be with me for the rest of my life. Once again many thanks to the YET for helping me to participate in this life-changing experience.